The historical city of Durham is the perfect place for a day-trip in the North East. 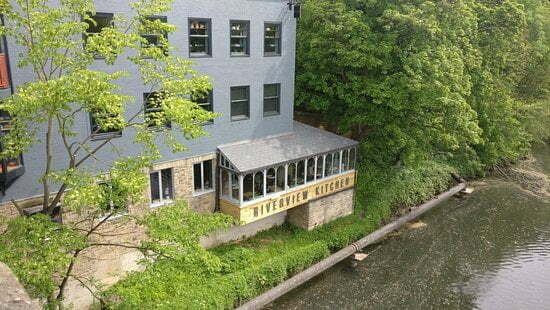 And if you’re heading there with friends or loved ones, Durham’s Riverview Kitchen is just the place to be if you want breakfast, brunch, lunch or a sweet treat and a cup of tea. Situated right on the bank of the river with window and outdoor seating providing a lovely view, the Riverview Kitchen is a homey little place worthy of spending an hour or so. The interior is fresh with a vintage-esque theme, tea coming in lovely little pots and sugar cubes kept in small jars on every table. It’s quaint, but not in a pretentious or off-putting way. I have been to Riverview Kitchen probably too many times for a student who is catered, but it’s a favourite, so what can you do? Be it the stacked, fluffy American-style pancakes with a topping of your choice, chicken ceasar wrap, full English or a gorgeous sandwich with chips, coleslaw and salad, there’s something delicious every time you go. And, if you’re vegan, they can cater for your dietary needs perfectly too – a falafel stack will leave your mouth watering. And, to top it all off – the price at Riverview Kitchen is just right. It’s affordable due to its very kind pricing, so get yourself along next time you’re in Durham.